From the beginning of the Republic, the social role played by the president's wife had political implications. Except for the most reclusive, each could have an impact. By extravagant spending or remarkable economy, by altering a guest list and focusing her pleasantries at parties, a First Lady had the power to help or hinder an administration. While some women used the opportunity to great advantage, thus increasing their husbands' popularity and support, others made enemies. Martha Dandridge Custis Washington, with no precedents to guide her, originated customs that her successors would continue to observe. Although her role is not clear in the decision to combine the chief executive's residence and office on one site, the arrangement required her cooperation because it drew the entire household into politics. Neither guest nor host could label a visit as entirely personal or nonpartisan. Martha Washington's decision to give many parties and to open her home to all callers on New Year's Day drew additional attention to her role. While she appeared to take no notice of nascent political rivalries (and approving Americans rewarded her with the title "Lady Washington"), her successors encountered more difficulty staying out of politics. Dolley Payne Todd Madison expanded the social role, adding a more rigorous schedule. Even before becoming First Lady, she had some experience with the position—the widowed Thomas Jefferson had asked for her help at White House parties when his daughter could not be present to do the honors. After James Madison's inauguration in 1809, Dolley's charm and popularity proved an asset for the shy, retiring president. She curried favor with legislators' wives by making social visits to all who came to the capital, thus serving as a kind of national Welcome Wagon. Exceptionally egalitarian in her parties, she opened the President's House on Wednesday evenings to almost anyone inclined to call. All persons who had been introduced to the president (or knew someone who had) were invited to make an appearance. Dolley Madison remained inscrutable about her preferences, except in her admiration for her husband, which was unquestionable. When James Madison dismissed Secretary of State Robert Smith in 1811, she invited Smith and his family to dinner, and when they failed to appear, she called on the family twice, Smith wrote, "with professions of great affection." In James Madison's 1812 bid for reelection, his wife used White House parties to attract support, and some historians have judged her contribution to the November victory as not inconsequential. Dolley Madison played such a prominent role in running what was still sometimes called the President's House that she cemented into public consciousness a close association between it and the First Lady. The Adamses had resided there only a few weeks, and Thomas Jefferson showed much less interest in it than in his beloved Monticello, so it was left to Dolley Madison to turn it into a showplace. With the help of Benjamin Latrobe, an architect, she furnished the State Dining Room and the suite of rooms on the south side of the first, or public, floor, later known as the Red, Green, and Blue Rooms. When the British troops attacked Washington in August 1814, she arranged for the most treasured possessions in the house, including the Gilbert Stuart portrait of George Washington that Congress had purchased in 1800, to be removed from the mansion and stored in a safe place. Even after the end of her husband's presidency, Dolley Madison remained socially active and prominent up to her death in 1849. Dolley Madison is depicted saving the Declaration of Indpenedence before fleeing the White House during the British raids on Washington, D.C., in the War of 1812.
there) and in Washington, D.C., for her stylish appearance. But she showed little interest in using First Ladyship to increase her husband's popularity. She entertained much less than her popular predecessor and refused to make social calls on every legislator's household. Washingtonians wrote her off as snobbish and unfriendly, and some of them boycotted the few parties she did give. When she insisted on inviting only close friends and family to the wedding of her daughter, Maria, in 1820 (the first marriage of a president's child to take place in the White House), she made more enemies. 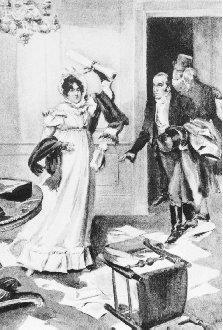 Her long absences from the capital, explained as due either to her own illness or to visits to her married daughters, meant that the president entertained at bachelor parties for men only, leaving the wives of legislators (who had come to the capital expecting a lively social season) miffed to be left out. Elizabeth Monroe's one positive contribution to her husband's presidency resulted from the particular timing that put the Monroes in the White House immediately following its rebuilding in 1817. Faced with the task of furnishing it, they decided to purchase the materials from France, although James Monroe played a larger part than his wife in the ordering. In the twentieth century, when attention turned to restoration and historic preservation, the Monroes were singled out for their elegant taste and their acquisition of what became the most prized possessions in the White House. Lou Hoover, who furnished rooms on the second floor with reproductions of the Monroes' own furniture in 1932, named the suite for the Monroes. Louisa Johnson Adams often complained about the heavy social obligations of any woman whose husband aspires to high political office, but she worked hard for John Quincy Adams' success. While he served as secretary of state, she had been among the first women to attend congressional debates, sitting in the visitors' gallery as important matters were discussed, and she worried that people watched her face for some indication of her husband's opinions on matters of state: "Trifling occurrences are turned into political machinery," she wrote. To enhance her husband's popularity, she entertained large numbers of guests and made many calls on legislators' families. She considered the visits particularly unpleasant and complained in her diary that she thought they would make her "crazy" but, heedful of her husband's future, she persevered. "It is understood," she wrote in her diary, "that a man who is ambitious to become President of the United States must make his wife visit the Ladies of the members of Congress first. Otherwise he is totally inefficient to fill so high an office." The only president's wife to be born in Europe, Louisa Adams knew that some of her critics found her disagreeably foreign, but she won admirers for her charming and self-deprecating manner—a marked contrast to her husband's temperament. Although well educated and sophisticated, she lacked self-confidence, and when she wrote her autobiography for her children, she titled it "Adventures of a Nobody." Although popular in the capital, she saw her duties as entirely social and ceremonial. As for any influence in legislation, she admitted, "I have never once been consulted." Sarah Childress Polk was singled out by contemporaries and later by historians for holding strong opinions of her own. Educated at one of the best girls' academies in the South, she had married at nineteen, and during the time that James K. Polk served in the House of Representatives, she usually accompanied him to the capital. By the time he became president, she had many influential friends in Washington, both men and women. Just before the 1845 inauguration, Vice President-elect George Dallas wrote of her: "She is certainly mistress of herself and I suspect of somebody else also." Sarah Polk's letters to her husband indicate that she understood the political controversies of the day and knew where she stood on them, but in line with traditions for women at the time, she did not comment publicly or campaign openly. While her husband was out looking for votes, she remained at home but wrote to inform him of the latest developments, explaining on one occasion that the Democrats' stock had risen ("they are in exstacies [sic]") while that of the Whigs had fallen. With so many of her husband's potential supporters out of town, she complained, "I have not much to opperate [ sic ] on." In the White House, Sarah Polk used invitation lists to reward supporters and punish opponents, but she did not voice her opinions on controversial issues. In line with her strict religious observances, she permitted no music to be played on Sunday and attempted to get guests to accompany her to church services. James K. Polk's biographer Charles Sellers concluded that she "became increasingly indispensable, as secretary, political counselor, nurse, and emotional resource" to her frail husband, but that her success in the capital was mainly social. The tragic circumstances associated with Mary Todd Lincoln's tenure limited her success as First Lady, although she began with rave reviews. National magazines described her costumes and parties in glowing terms, and one of them referred approvingly to the "perfectly molded shoulders" of the "Republican queen." The Civil War quickly complicated matters for Mary Lincoln. Many of her relatives had sided with the Confederacy, and several of them fought against Union troops. When Mary's half brother was killed in battle, the Lincolns invited his widow to stay with them at the White House, thus feeding suspicions that Mary was a "traitor." The often-repeated story that Abraham Lincoln was called on to defend his wife from such charges in front of a Senate committee is, however, now considered to be untrue. Although she came from a Kentucky family of substantial means and had been acquainted with national political leaders (including Henry Clay) in her youth, Mary Lincoln showed great insecurity about presiding over the White House, and many people preyed on this weakness. On her way to her husband's inauguration in 1861, she traveled by way of New York to order several new outfits, and her spending continued to grow in the following four years. She lavished large sums on herself as well as on the executive mansion, often without the knowledge or consent of her husband. Merchants extended credit, some of them perhaps hoping for favorable treatment from the president. When Abraham Lincoln was nominated for a second term in 1864, his wife's relief was based partly on the fact that she would not immediately be called on to pay off her debts, then estimated to exceed the president's annual salary. People seeking access to the president flattered his wife, and his announcement that "women have no influence in this administration" did little to stop them. Observers noted that she frequently appealed to her husband for favors for others, and if he failed to comply, she would invite the supplicant to dine with the president so as to present the case in person. Even after her husband's death, Mary Lincoln continued to play a public role, and she became one of the most written about of all presidents' wives. The assassination cast her in a martyr role, and she became preoccupied with the subject of money. Living in Europe apparently brought little satisfaction, and after her youngest son, Tad, died in 1871, she became increasingly despondent. In 1875, her one surviving child, Robert, arranged for a sanity hearing that resulted in her being confined briefly to a mental institution near Chicago. With the help of influential friends and a journalist, she plotted her way out a few months later. Julia Dent Grant, First Lady during the presidency of Ulysses S. Grant, from 1869 to 1877, thrived on the social leadership role accorded the president's wife in the capital. Her tenure coincided with the development of new interest in presidents' families—partly because of the spread of new magazines aimed at a national audience, including women readers. In 1873, Godey's Lady's Book began a regular column on Washington under the authorship of the fictional "Aunt Mehitable," who had purportedly accompanied her legislator son to the capital. Actually the writing of Harriet Hazelton, the column enlightened readers about social events, fashion trends, and even the condition of the teeth of some of Washington's most prominent women. Aunt Mehitable made no secret of the fact that she found Julia Grant unattractive, and she pointed out that the First Lady was seen to best advantage in dim light, which concealed the fact that her eyes were crossed. Julia Grant's good nature and extravagant spending drew favorable attention to herself and the president. The Grants' youngest son, Jesse, nine years old at the beginning of his father's term, and daughter Ellen ("Nellie"), who was fourteen, both became very popular, and their mother did little to restrain public curiosity about them. When Nellie married in 1874, the White House wedding was the social event of the season. Julia Grant's state dinners, consisting of as many as twenty-nine courses and several wines, also attracted praise. After leaving the White House, Julia Grant decided to write her memoirs, possibly motivated by her husband's success in writing his. Only about thirty pages of the book, which was not published until 1975, deal with the White House years, and these focus on the social and housekeeping aspects of being First Lady. The author did take credit for helping influence the president to veto "the all-important Finance Bill," although her description of how this occurred makes clear that she had very little understanding of what the legislation involved. Her entertaining in the White House, where she invited friends without regard for the political implications, underlined her naïveté. Lucy Webb Hayes's tenure as First Lady marks a change in the role. The title "first lady" (as in "first lady of the land") came into occasional use by the press in describing her activities. When she accompanied the president on his transcontinental trip in autumn 1880, she was greeted as a heroine. Part of her national prominence resulted from the approval of temperance advocates who were delighted with her ban on alcohol at White House parties. Rutherford B. Hayes apparently shares much of the responsibility for the temperance stand, but it was his wife, ridiculed as "Lemonade Lucy," who took the blame. Her own opinion on the subject was apparently less fixed than was generally assumed. Her biographer Emily Apt Geer concluded that although Lucy Hayes did not drink, she held no strong views about the drinking habits of others. But her decision to endorse temperance evidently attracted favorable attention, and even in a time when virtually no women had the franchise, it won votes. Rutherford B. Hayes's diary entry on 16 January 1881, just before leaving office, endorses that view of her political effectiveness. Frances Folsom Cleveland, although a young bride when she first moved into the White House, showed other ways that a popular president's wife could enhance his appeal. Only twenty-one when she married, she was the daughter of Oscar Folsom, who had been Grover Cleveland's law partner in Buffalo before his accidental death in 1875. After graduating from Wells College in June 1885, Frances Folsom had spent a year touring Europe with her mother. Her marriage to the forty-eight-year-old president early in his first term was evidently arranged before the trip but kept a secret until the Folsoms returned to New York in late May 1886. The wedding ceremony on 2 June 1886 in the Blue Room of the White House (the first such ceremony for a sitting president) introduced Americans to a young First Lady whom they would make very popular. Frances Cleveland is usually rated just behind Dolley Madison as the most liked of all nineteenth-century presidents' wives. Her youth and seriousness, her practical down-to-earth approach to White House living, endeared her to many Americans who imitated her in various ways. Women wore their hair à la Frances, twisted in a bun at the nape of the neck, and advertisers incorporated her image in their commercials. The president's marriage to a young woman of such wholesome, winning ways helped his reputation in some quarters, causing one historian to call it "a master political stroke." Grover Cleveland's relationship with a Buffalo widow, whose child he supported, had become common knowledge in the 1884 campaign and had somewhat tainted his reputation. Aside from that story, his rounded figure and rather lethargic appearance did not make for good copy at a time when news about the presidential household was more and more sought out. Before the end of Grover Cleveland's second term, Frances had given birth to three daughters, who helped establish his image as a devoted family man. In the summer of 1893, Frances Cleveland assisted her husband in keeping the press from reporting that the president had undergone cancer surgery. Grover Cleveland had been diagnosed with a malignancy in his mouth in May, but he did not want to reveal his condition because of fears that an ailing president might negatively affect the nation's economy. Arrangements were made to operate in secret. On 30 June, the Clevelands left Washington by train, ostensibly en route to their summer home in Buzzards' Bay, Massachusetts. Somewhere along the way, the president left the train and boarded a yacht that had been fitted out like an operating room. While he underwent surgery, his wife, who was seven months pregnant at the time, proceeded northward with their two-year-old daughter, Ruth. On 4 July, when the president had not yet arrived in Massachusetts, reporters questioned the First Lady, who asked them not to write about his absence—she assured them that President Cleveland would appear shortly. Except for one account (published at the time and immediately denounced as false) the story of what really happened did not appear until 1917, when one of the attending surgeons wrote about it for the Saturday Evening Post . Caroline Scott Harrison, whose single term as First Lady fell between the two terms of Frances Cleveland, also became a national figure, and although she attempted to keep her job entirely social, it spilled over into matters affecting the president, Benjamin Harrison. Her most publicized effort involved a plan to enlarge the executive mansion, which she deemed too small to accommodate the extended family that accompanied the Harrisons to Washington. Presidents' families had repeatedly complained of their cramped living quarters, and Caroline Harrison resolved to make a large addition to the White House. Working with architect Frederick Owen, who drew up the plans, she suggested constructing new wings to form a quadrangle, with separate areas for the residence and a museum. Although there appeared to be considerable enthusiasm for the project (and the Senate passed the necessary legislation), it fared less well in the House of Representatives, where the Speaker, angry with the president over an appointment, failed to bring it to the floor. Had she succeeded in overseeing major alterations at the White House, Caroline Harrison might have become better known for her other efforts. An accomplished artist, she publicized American themes in a White House china pattern featuring a cornstalkand-flowers border and in her own clothing. Widely respected for her efficient management of the presidential household, she was singled out as a model wife. Her death in the White House on 25 October 1892, just days before her husband failed in his bid for reelection, added a somber final note to her husband's one-term administration. Edith Carow Roosevelt's nearly eight years as First Lady marked an institutionalization of the role. Women who preceded her in the job had relied on relatives and friends to assist them in their entertaining and correspondence, and often in their decorating, but Edith Roosevelt preferred hired help. She arranged for Isabella Hagner, formerly secretary to one of Theodore Roosevelt's sisters, to be transferred from the War Department, where she worked as a clerk, to the White House. Operating from a desk on the second floor of the residence, Hagner acted as the First Lady's staff, preparing news releases including information about dinner guests, the president's family, and the First Lady's wardrobe. More interested in literature than in politics, Edith Roosevelt apparently played little part in discussions of substantive matters affecting the nation. Her impact on the day-to-day running of the White House was, however, enormous. She had a well-earned reputation for economy and the self-confidence to put her ideas into practice. In the extensive 1902 renovation of the White House, she worked with the architectural firm McKim, Mead, and White to reallocate space so that the family had more comfortable quarters. Musicales, featuring performances for small groups of invited guests, had occasionally been scheduled by other First Ladies, but Edith Roosevelt was the first to make them a regular part of the president's entertaining. To help her make choices from among the many artists who sought to perform at the White House, she enlisted the help of Steinway and Sons, the New York piano manufacturers, who provided a consultant. Although mother of five children (and stepmother to Alice, Theodore Roosevelt's daughter with his first wife, Alice Lee of Boston), Edith Roosevelt maintained a detached demeanor that won her many admirers. She gave no speeches in support of her husband's candidacies, but broke her long silence when she consented to address a large Madison Square Garden rally in 1932. Her subject was Herbert Hoover—and why he would make a better president than his Democratic opponent, Franklin D. Roosevelt, husband of Theodore Roosevelt's niece Eleanor. Helen Herron Taft is often credited with having had a large role in her husband's political career. William Howard Taft's acceptance of an appointment to head a commission to the Philippines in 1900 was based partly on her enthusiasm for travel. "It was an invitation from the big world," she later wrote, "and I was willing to accept it at once and investigate its possible complications afterwards." When the couple returned to Washington so that William Howard Taft could enter the cabinet as secretary of war in 1904, Helen appeared set on his becoming president. She had been a guest of the Rutherford B. Hayes family when she was a young girl, she later explained, and she had determined then that she would one day preside over the White House. When President Theodore Roosevelt appeared ready to name her husband to the Supreme Court in 1906, Helen Taft scheduled an appointment with him to express her own views. Although she left no account of that meeting, President Roosevelt's letter to William Howard Taft leaves little doubt about her impact: After "a half hour's talk with your dear wife," he wrote, he had decided against appointing Taft to the Court. During the 1908 presidential election, Helen Taft was often described as intelligent and forceful, predictably an influence on her husband. She lent credence to such claims with her own announcement that she did not like to be shunted off to lunch with a group of uninteresting women while her husband talked over important matters with other men. After the inauguration, she managed to ride to the White House beside the president, a spot previously reserved for the outgoing chief executive or some other prominent man. Helen Taft's physical collapse due to a stroke two months after the inauguration curtailed reports of her power and influence. She retired to the Tafts' vacation home in Massachusetts for the summer to recuperate. By October 1909 she was back in the White House, but she kept a low public profile and was often absent on important occasions. The Tafts' one daughter, Helen, and the First Lady's sister helped in White House management and in the social schedule. Helen Taft's main impact on Washington was cosmetic. She arranged for the shipment and planting of several thousand cherry trees along the Potomac. Immediately after leaving the White House, Helen Taft began writing her autobiography, which was published in 1914. Recollections of Full Years thus became the first autobiography of a First Lady to be published (Julia Grant had written hers earlier but it was not yet in print). Only a fraction of Helen Taft's book dealt with the White House years, and that focuses entirely on the social aspects of the role. Ellen Axson Wilson, although First Lady for only seventeen months, explored new ways that a president's wife could leave her mark on her husband's administration. As a young woman she had studied art in New York City, and during the time her husband was president of Princeton University and then governor of New Jersey she exhibited her paintings, sometimes signing them "E. Wilson" in order to play down her relationship with Woodrow. But rather than concentrating on art projects while in the White House in 1913 and 1914, she turned to housing reform, an interest that had survived since her student days when she had taught in a missionary school in New York. She arranged for housing reformers to meet with legislators at receptions, and she made cars available for touring slums located only a few blocks from the White House. Her efforts helped generate interest in housing reform, resulting in legislation, sometimes called the Ellen Wilson Alley Housing Bill, passed by the Senate just hours before she died on 6 August 1914. The House of Representatives quickly followed suit. Although a lack of funding crippled the law's effects, this marked the first time that a president's wife had been so prominently connected to legislation. The potential for a woman to participate in her husband's administration was not lost on Florence Kling Harding. She had assisted Warren G. Harding in running his Marion, Ohio, newspaper, and she evidently saw no reason to play a lesser part in his political career. She involved herself in the 1920 campaign, overturning, for example, a decision to reply to rumors that her husband had black ancestry. But her impact on policy matters while First Lady is difficult to assess, partly because she destroyed so many of the papers that would have helped define it. Staff credited her with helping to shape wording of the president's speeches and with vetoing a plan that would have provided an official residence for the vice president, but she herself claimed her role was little more than social and ceremonial. She had a good relationship with the press, and she occasionally scheduled meetings of her own with women journalists. Ill with a kidney disease for much of her adult life, Florence Harding made a special point of looking strong and healthy. The "Duchess," as her husband called her, enthusiastically greeted tourists who passed through the executive mansion, and whenever she was too sick to appear in public, as happened frequently, she attributed the indisposition to food poisoning. In the end, her attempt to manage the press worked against her. Americans were as unprepared for her death on 21 November 1924 as they had been for her husband's nearly sixteen months earlier. Grace Goodhue Coolidge, the first president's wife to have earned a university degree, made a point of staying out of politics. She insisted that she did not know the details of her husband's daily schedule or of his decision not to run for a second term in 1928 until she was informed along with the rest of the nation. Her influence was almost entirely one of image—not inconsequential for a less-than-personable, laconic president. Charming and witty, she made self-deprecating comments about herself that won many admirers, and her fondness for animals and small children was legendary. She was frequently photographed with one of her many pets—including a raccoon named Rebecca and a collie, Rob Roy. Her courageous response to the grief that engulfed both her and the president after their younger son, Calvin Coolidge, Jr., died in the summer of 1924 further endeared her to Americans. Grace Coolidge's attempt to change substantially the furnishings of the White House failed. Following her husband's election to a full term in 1924, she formed an advisory committee composed of experts and connoisseurs, some of whom had just completed an exhibit of American furniture at New York's Metropolitan Museum of Art. She appealed to Congress for an increased allotment and for permission to accept donations of period furniture and art. When controversy developed about the appropriate style for the refurbishing, the plan was dropped, but Grace Coolidge's example prepared the way for other First Ladies, including Jacqueline Kennedy. Lou Henry Hoover came to the White House with a full understanding of the major issues of the day, but she played the role of First Lady much as it had been played earlier. She neither campaigned for her husband nor gave interviews that revealed any differences between herself and the president. When she gave talks on radio—the first president's wife to do so—she limited herself to topics that reinforced her husband's voluntary approach to solving the problems of the Great Depression. Her efforts to catalog White House furnishings, with the help of friends and volunteers, did not result in a publication, although attention was called to a long-felt need. Considerable controversy surrounded Lou Hoover's decision to invite Jessie DePriest, wife of African-American congressman Oscar DePriest of Chicago, to a tea for legislators' wives. One southern newspaper editorialized that the First Lady had "defiled the White House"; another suggested that she had offered the nation "an arrogant insult." In other quarters, the incident underlined the First Lady's reputation for egalitarianism. Opinion is divided on Lou Hoover's impact on her husband's appointments. But in a single term, Herbert Hoover named seven women to jobs requiring Senate approval, bringing the total to more than double what it had been in 1920. She was an enthusiastic supporter of noncompetitive sports for women and of the Girl Scouts. First Ladies had traditionally served as figurehead leader of the Girl Scouts, but she worked hard at the job, helping to raise funds and encouraging membership. Her large personal fortune made possible her support of many ordinary people with hardship cases who asked for her help during the Great Depression, although she refused to publicize her generosity. The largesse continued after she left the White House, and when she died in 1944, her husband was surprised to receive many letters from people he was unacquainted with, wanting to know why their checks had stopped. Elizabeth ("Bess") Wallace Truman followed a precedent-breaking First Lady, Eleanor Roosevelt, into the White House in 1945, but she played the part her own way. While her husband served as U.S. senator and vice president, she remained virtually unknown in Washington. Her unusually adamant insistence on privacy, later explained by her daughter Margaret as originating in the suicide of David Wallace, Bess's father, when she was eighteen, made her wary of reporters, and she declined to give interviews as First Lady; after finally consenting to answer reporters' questions in writing in 1947, she relied on "no comment" for nearly a third of the thirty questions submitted. Bess Truman refused to comment on matters of public policy, and her impact remains unclear. Harry Truman credited her many times, saying that she had been his "full partner in all my transactions, political and otherwise." He told reporters that he consulted her on important decisions, including use of the atomic bomb, the Marshall Plan, and Korea, because "her judgment was always good." Staff members concurred that he frequently brought a briefcase to the residence part of the White House and went over the contents with his wife. His letters to her, at least those that have been published in Dear Bess: The Letters from Harry to Bess Truman, 1910–1959 , frequently seek her advice. Much of the correspondence between the Trumans is unavailable, however, because Bess burned it. Their daughter Margaret wrote after her parents' deaths that her mother often felt shut out of important decisions in the White House. The one time that Bess Truman made a public statement about a controversial subject involved repairing the White House in 1949 after severe structural problems were discovered. Bess Truman urged retaining the historical value of the original structure rather than demolishing it and building a new residence in its place, an option that would have been less costly. During the extensive renovation the Trumans lived at the Blair House, and when they returned to the White House in early 1952 she left it to the president to conduct a televised tour of the premises. She confined her own appearances to the ceremonial: dedicating hospital planes, posing with poster children, and greeting wounded servicemen. Mamie Doud Eisenhower, the last First Lady born in the nineteenth century, left the job a ceremonial, social one as she had found it. Many years as wife of a military leader and university president had trained her to be an efficient household manager, and she thrived on the hostessing role. Her press conference in early March 1953 featured a list of her social engagements or, as one reporter summarized it, "tea by inexorable tea." When she published an article in a women's magazine during the 1952 campaign, she took an entirely neutral stand: "Vote for My Husband or for Governor Stevenson," she titled the article, "But Please Vote." Much about Mamie Eisenhower's style appealed to Americans. She invited popular performers such as Fred Waring to the White House, and she insisted that she and the president often ate their dinners from TV trays, just as millions of her countrymen were doing. Her popular hairstyle, breezy attitude, and recipe for fudge made her first name a household word. Dwight Eisenhower credited her "unaffected manner" with making the White House "livable and comfortable, and meaningful for the people who came in."